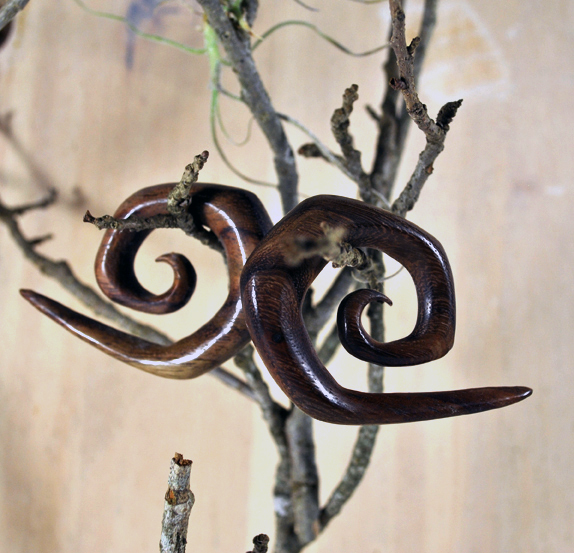 Handcrafted pair of gauged spiral earring tapers are expertly carved to take advantage of the natural beauty of the wood grain. Expanding on the traditionally tribal design these hangers are sure to impress with their uniqueness and rich coloration. These spiral earrings are different than the traditional spiral earrings with the bent nut design. The earring gauges are sold as a pair and as with all of our gauged earrings we try to carry most of the popular gauge sizes, but if you don't see your size listed please feel free to contact us or check back later since we're constantly restocking or adding new sizes and styles to our line.